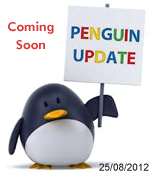 Sometime last week, Google’s Matt Cutts announced in an online discussion that there will be further Penguin updates that will be upsetting for many webmasters and website owners. As part of his discussions, he mentioned “Likewise Panda, we’re still in the early stages of Penguin where the engineers are incorporating new signals and iterating to improve the algorithm”. Due to the fact that Google is still working on defining, improving algorithm and adding more signals, result will have noticeable impact. It’s not that people should only expect data refreshing. Penguin updates target websites that use spam tactics. Do not use any automated programs for promotion etc which might put in spammer category. The latest algorithm update is mainly targeting towards spammers. Be alert if you are performing any such activities. If you use any tools that uses words such as “secret trick”, “exploit”, “fully automated” or “auto-pilot” then it’s likely that your rankings are at risk. Google algorithms are not stable yet, do not make drastic change-over of your website.